The Global Volcanism Program has no activity reports for Koranga. The Global Volcanism Program has no Weekly Reports available for Koranga. The Global Volcanism Program has no Bulletin Reports available for Koranga. The Global Volcanism Program has no synonyms or subfeatures listed for Koranga. Koranga Crater, a Pliocene-to-Holocene hydrothermal explosion vent complex (Pigram et al., 1977), is located in the Morobe goldfields in the Owen Stanley Range SW of Huon Gulf. The gold mineralization here prompted one of the world's last great gold rushes, beginning in 1922. Gold mineralization is thought to have been related to Pliocene maar formation and dacitic and andesitic lava dome extrusion. Gas emission and a landslide from Koranga in May 1967 were considered to have had either a non-volcanic (Pigram et al., 1977; Fisher and Branch, 1981) or hydrothermal-eruption origin (Sillitoe et al., 1984). Fisher N H, Branch C D, 1981. Late Cainozoic volcanic deposits of the Morobe goldfield. Geol Surv Papua New Guinea Mem, 10: 249-256. Pigram C J, Johnson R W, Taylor G A M, 1977. Investigation of hot gas emissions from Koranga volcano, Papua New Guinea, in 1967. Aust Bur Min Resour Geol Geophys Jour, 2: 59-62. Sillitoe R H, Baker E M, Brook W A, 1984. 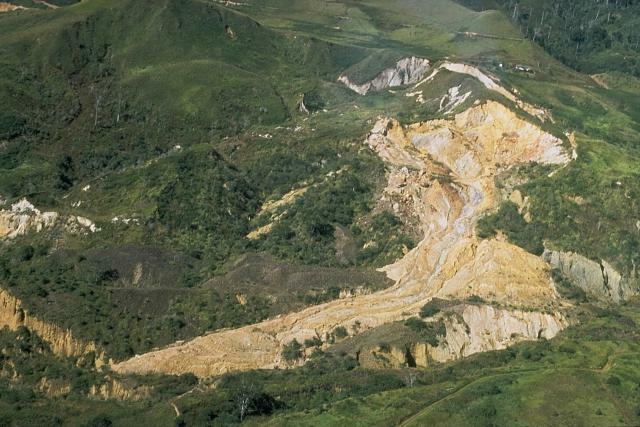 Gold deposits and hydrothermal eruption breccias associated with a maar volcano at Wau, Papua New Guinea. Econ Geol, 79: 638-655. The Global Volcanism Program is not aware of any Holocene eruptions from Koranga. If this volcano has had large eruptions (VEI >= 4) prior to 10,000 years ago, information might be found on the Koranga page in the LaMEVE (Large Magnitude Explosive Volcanic Eruptions) database, a part of the Volcano Global Risk Identification and Analysis Project (VOGRIPA). There is no Deformation History data available for Koranga. There is no Emissions History data available for Koranga. Koranga Crater, a Pliocene-to-Holocene hydrothermal explosion vent complex, is located in the Morobe goldfields of the Owen Stanley Range at the eastern end of the New Guinea Highlands. The gold mineralization here prompted one of the world's last great gold rushes in 1922. A landslide and possible hydrothermal explosion in May 1967 from a vent at the upper right produced the fresh landslide deposits seen in this photo. The volcanic origin of this event is uncertain. Photo by Wally Johnson, 1969 (Australia Bureau of Mineral Resources). There are no samples for Koranga in the Smithsonian's NMNH Department of Mineral Sciences Rock and Ore collection. Large Eruptions of Koranga Information about large Quaternary eruptions (VEI >= 4) is cataloged in the Large Magnitude Explosive Volcanic Eruptions (LaMEVE) database of the Volcano Global Risk Identification and Analysis Project (VOGRIPA).